Chapter III of the Life Divine introduces the concepts of the ‘cosmic consciousness’ and the ‘world –transcending consciousness’. Sri Aurobindo does not suddenly impose the concept of cosmic consciousness on his readers (which many others would have done on having a spiritual inking of it and which many would love to propagate thinking that an experiential contact with it is an epitome of spiritual realization). Rather he progresses towards it logically by examining the ancient dispute between subjectivity and objectivity. The votaries of subjectivity consider the material, objective world as secondary, existing only in the mind and vision of the Subject ( In the Indian tradition, the Subject is known as the ‘Witness’). The objective world is considered to have no independent Reality and “exists only in or for the consciousness that observes” (The Life Divine, pg.25) and thus is something ‘illusory’ - - a sort of Maya. 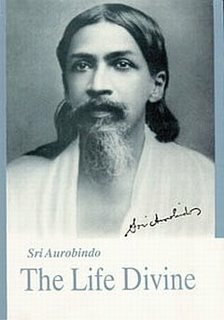 This conflict between subjectivity and objectivity was initiated as a metaphysical quest but, as Sri Aurobindo describes ‘is yet of the utmost practical import, for it determines the whole outlook of man upon life, the goal that he shall assign for his efforts and the field in which he shall circumscribe his energies’ (Ibid, pg.25). How true! How much do the physical scientist, the pharmacologist and the psychologist strive to tackle ‘observer bias’ so as to make their experimental results universally acceptable? How much the pharmacological researchers as well as the behavioral scientists have to toil for ‘double –blind’ trials? (Incidentally, some of the archaic philosophers who studied Sri Aurobindo wondered if His Thought should be taken up by psychology – he belonged to spirituality and hence to metaphysics beyond psychology! When Sri Aurobindo Himself asserts that even a metaphysical quest has a practical ramification, He, in a way, authenticates the study of the psychological perspective of His Thought! Especially, the area of subjectivity vis-à-vis objectivity ‘raises the question of the reality of cosmic existence and, more important still, the question of the value of human life’) (Ibid, pg.25). Sri Aurobindo examines this ‘subjectivity verses objectivity’ debate and finds it cannot be solved logically as we neither have enough physical data of the material universe nor have adequate experiential knowledge of universal non-material systems. Therefore the only possibility left is to progress ‘by an extension of the field of our consciousness or an unhoped - for increase in our instruments of knowledge’ (Ibid, pg. 26). In doing so, an inner enlargement of the individual experience culminates in a universal, cosmic experience - the individual consciousness extends into the cosmic consciousness. This extension also marks a change in the status of the ‘Subject’ or Observer (the ‘Witness’ in the Indian metaphysical tradition). The Subject is no longer the consciousness of the ordinary ,limited, embodied human being (as we know ourselves individually) but a poise of an universal or cosmic Consciousness ‘embracing the universe and appearing as an immanent Intelligence in all its works…’(Ibid,pg.26). (2)	If the objective world is considered to be transitory and phenomenal, it is not something ‘separate’ and ‘delinked’ from the cosmic ‘witness’ consciousness but has actually evolved out of it and can dissolve into it by an ‘act of knowledge or by an act of conscious power’(Ibid,pg.26). Beyond the ‘Universe’ as a ‘Transcendental’ principle or Being that supports & transcends the individual as well as the cosmos. Sri Aurobindo writes about the Witness(or the Observer or the Subject) : “Not organized mind, but that which, calm and eternal, broods equally in the living earth and the living human body and to which mind and senses are dispensable instruments, is the Witness of cosmic existence and its Lord”(Ibid, pg.26). He adds “….the worlds are only frames for our experience, the senses only instruments of experience and conveniences. Consciousness is the great underlying fact, the universal witness for whom the world is a field, the senses instruments” (Ibid, pg.24). And the Time-gallopings of the deathless Horse. With its diamond hood of joy and fangs of pain. The bliss and splendour of the eternal plane. Assenting to Thy all-wise inscrutable will.